Washington State is known for the natural beauty of its landscapes and open spaces, and habitats that support a remarkable variety of fish and wildlife species. The survival of these species depends in part on their ability to move safely throughout the environment to find food, reproduce and migrate – this is often termed “habitat connectivity”. 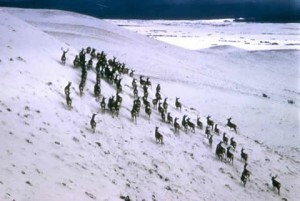 However, many of the state’s wildlife populations are at risk of losing this connectivity because of increasing development pressure and barriers on the landscape. The emerging threat of climate change will make the need for habitat connectivity even more critical, as many species will need to adapt to a changing landscape. Now, more than ever, it is important to develop a collaborative scientific analysis to identify where to conserve and restore habitat connectivity and natural landscapes across the West ensuring both the long-term viability of our state’s wildlife populations, and the vitality of our urban and rural communities and working lands. 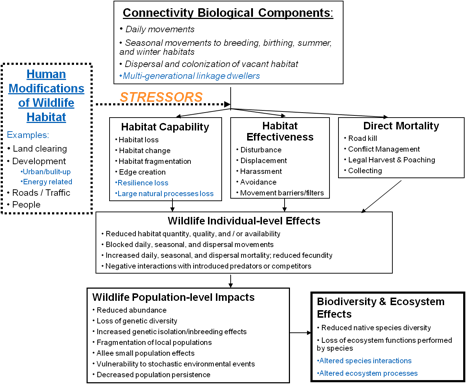 In order to manage and sustain our wildlife and natural areas, we need to understand the degree to which stressors have reduced connectivity. We attempted to capture these stressors in the diagram below.